Since I started with this layout, my plans have evolved. 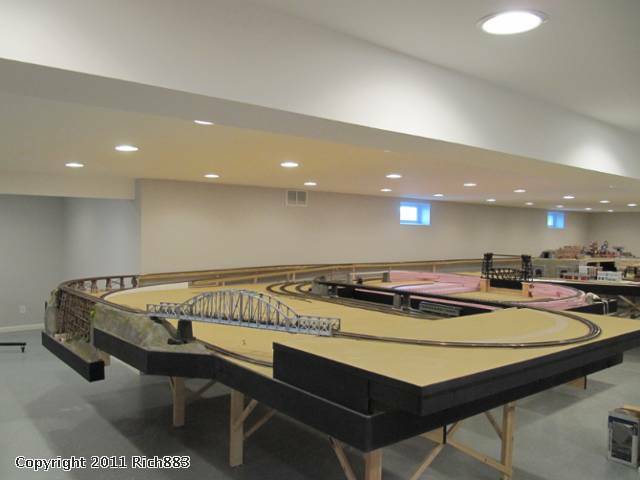 First it was about getting things started and running some trains, then I realized I wanted to finish the room – unfortunately around the layout – I migrated to liking more scenery, and so on. 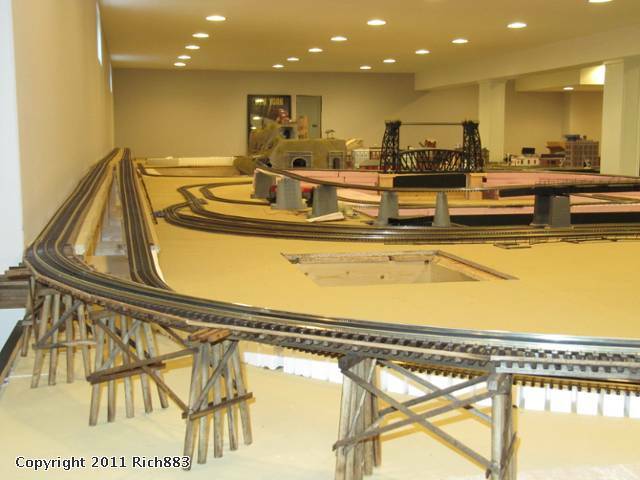 Over this time I found I really liked to run longer trains and more running than my current layout could allow. I liked the scenery work I had done (maybe 1/3 done) and I didn’t want to lose the work I had sunk into it. All this had me thinking about ways to expand what I had done, but shift to the approach I was looking for, a new base to grow from. 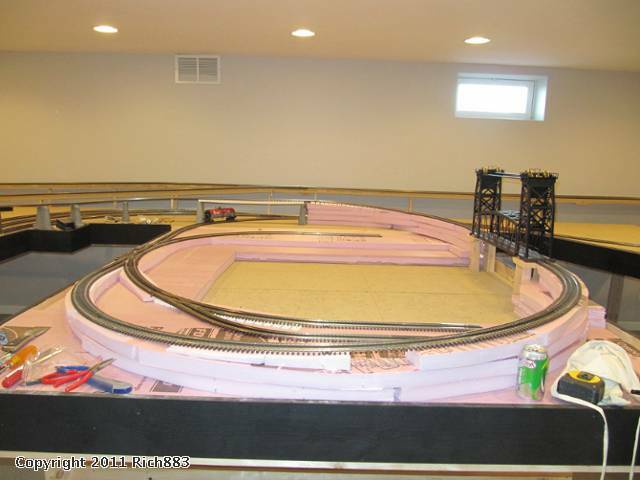 Here is the basic track plan I started with, while the scenery and building placement is not real accurate here, the track plan is what I have been running, it take up about 24ft x16ft. 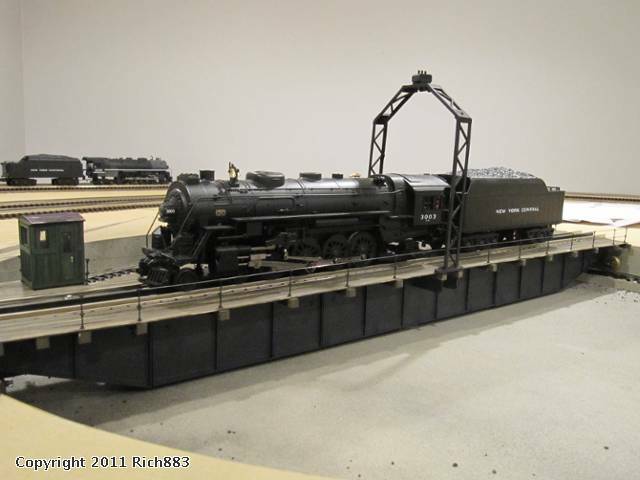 I use Atlas track and switches. Here are some photos taken a bit before I decided to make some changes. 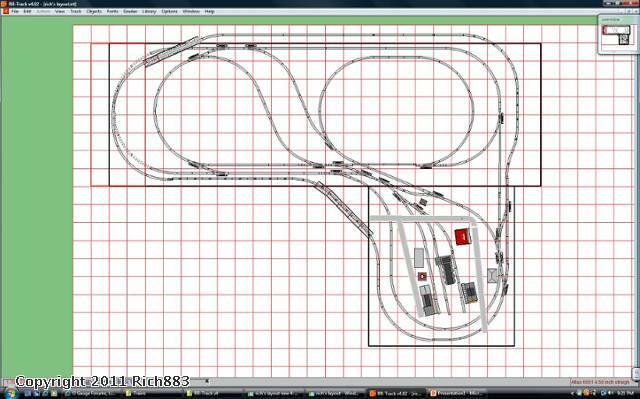 It seemed the sooner I started, the less track I had to rip up (literally in the case)After some thought I looked to move to this track plan, while I expect some changes like adding more sidings for industry, the basic flow will remain the same. I wanted to take advantage of the large wall space I had, and create some peninsulas to break up the viewing angles and set some different scenes. This one is about 43ftx30ft. To accomplish this I had to cut the existing bench work apart, and move the two pieces to create two different peninsulas. 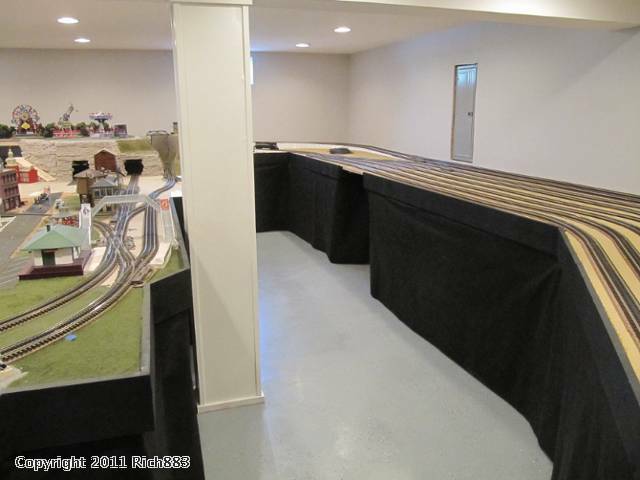 The goal was to keep the existing track work and buildings/scenery in place, and move these to a new location, which turned out to be both harder and simpler than I thought. 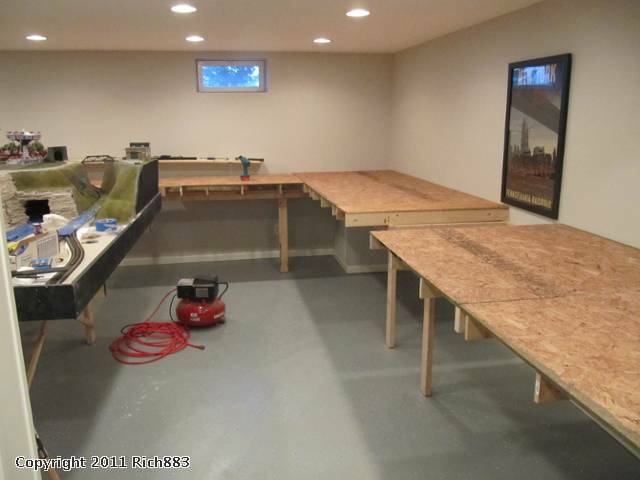 The separate pieces were much too heavy to lift and drag around the room, and while I had leveling feet, I did not build the bench work with wheels. What turned out to be simpler than I thought was to jack up the bench work and place mover’s dollies under it, and once all feet were up, pushing the entire piece into place was not too hard. 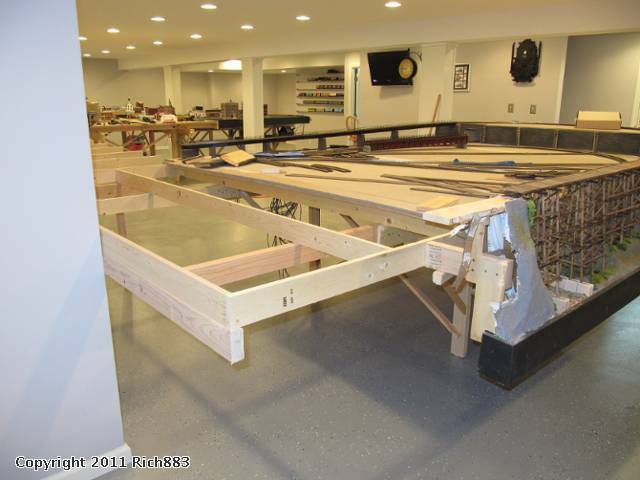 Once the existing pieces were in place, I started adding the bench work support structure to tie the pieces together. 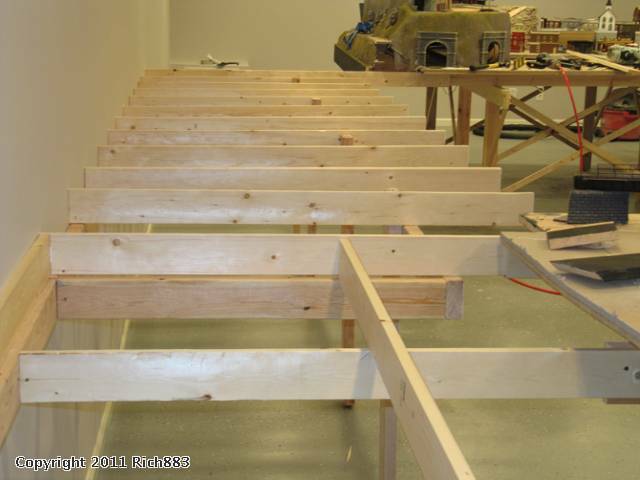 Construction is with dimensional lumber, mostly 1x4 and 2x4 with a combination of screws and nails to secure it together. I have started covering the frame with ½” OSB, and that will be covered with homasote. The elevated grade at the back will have homasote on it before I lay cork roadbed and track. 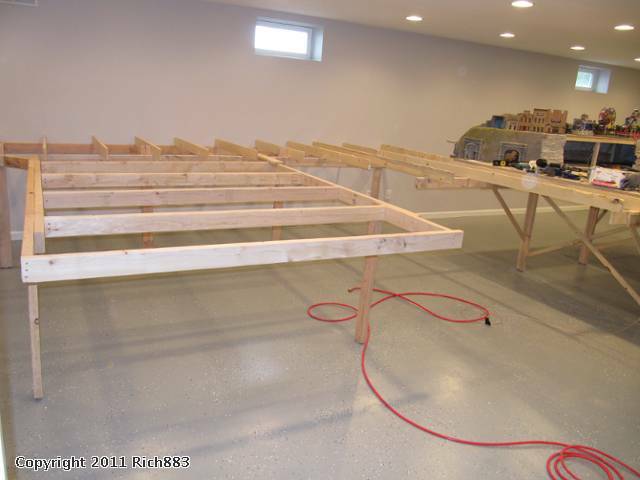 I think I am about half way done with the bench work. I will post more photos as I make some progress, and of course comments welcome. WOW!! Neat & clean room, neat & clean workmanship! You get the clean room of the year award! 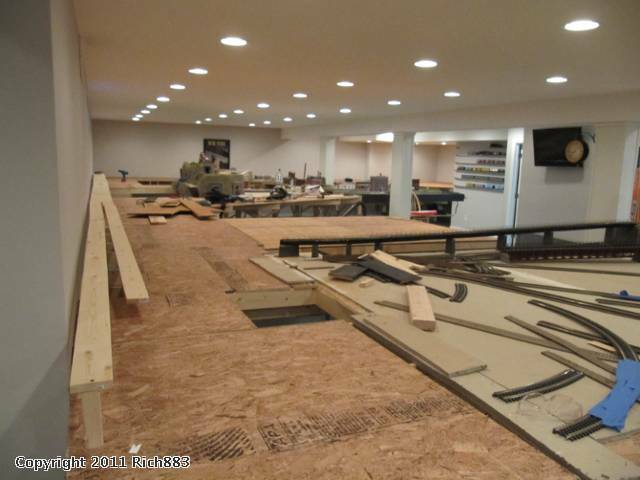 It was not until the next to last photo that I saw any sawdust on the floor. Very nice expansion project you have going there. When i first seen your layout in the middle of that big room, I said to myself boy this guy has alot of discipline or a strict wife to stay in that area with so much room to use. 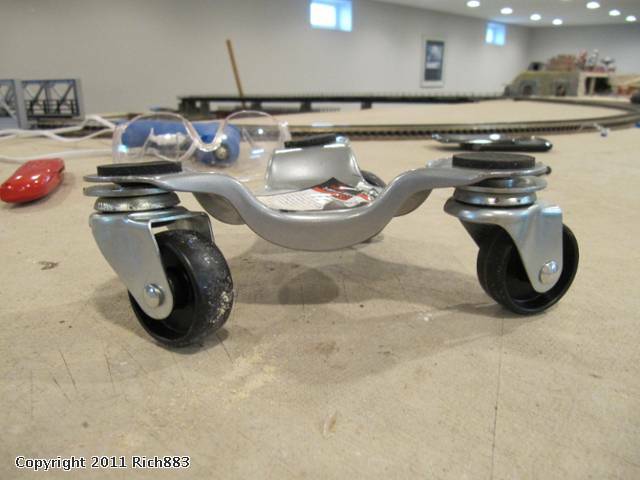 I also pulled that "wheel trick" on the wife.LOL Sections could be wheeled out of the way for when company comes over. 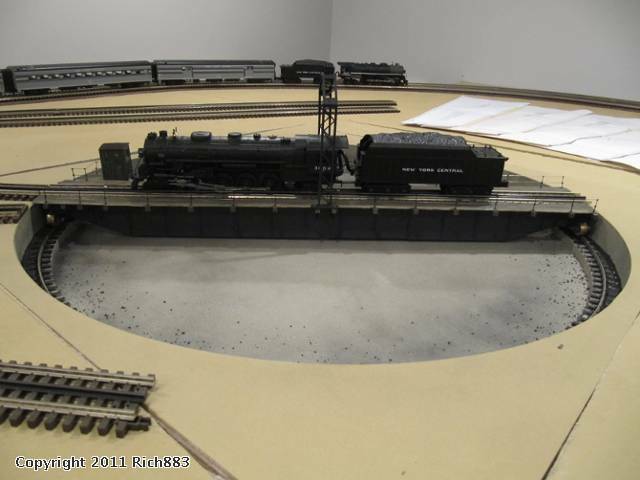 Their still under one section of the layout. I know you did it for a different reason.Great idea. 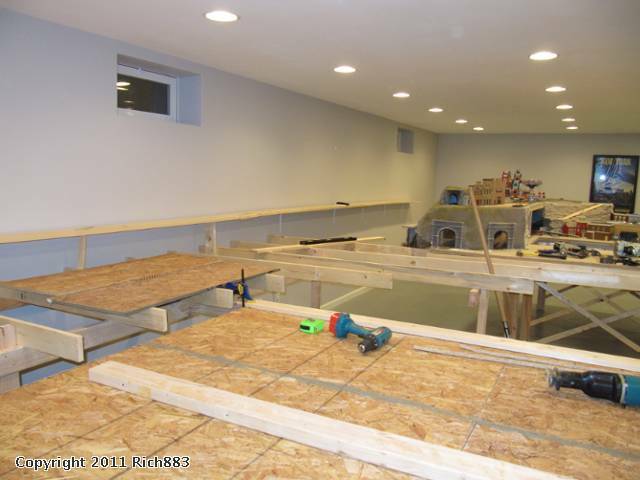 Rich it is looking great, you are gonna have alot of fun when all is operational. Congrats on the approval of more land from the Land Appropriation Commity...(The Mrs.).. That is gonna be one fine layout, and it's amazingly clean in there...how did that happen? Anyway great job and it looks great, keep the pics coming. Don't call me irrational you know that makes me crazy. 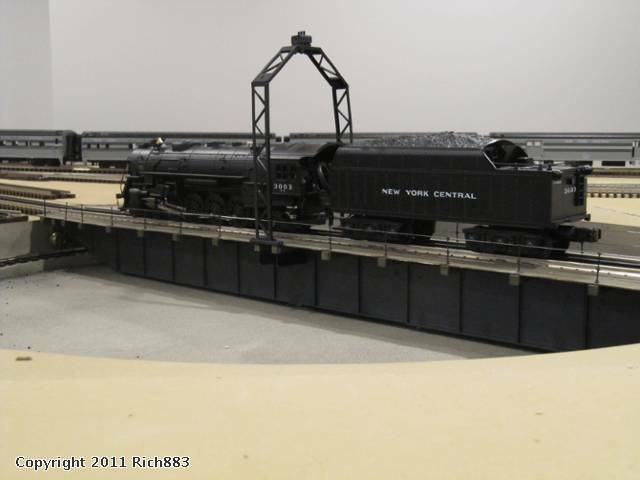 And come see my videos on modeling and rail fanning the prototypes. Me three! After reading this thread all I could think is it's probably a little late to suggest you use the entire lonely looking space for the whole train layout. By the way it looks like you have an extra 7-8' left on the left side of your room, you may as well stretch her out while your at it. I've always admired your work and I kind of wondered why you didn't use the whole space for a perimeter layout, I just figured you had your reasons. Nice work as always and keep us up to speed on your progress. Beautiful work Rich. I know the feeling about always looking for a way to expand. 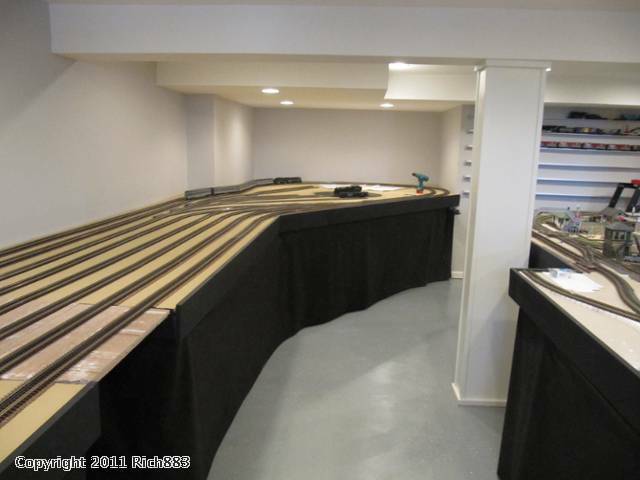 My layout is nowhere near scope of yours, but after about 2 years of tinkering with RR track, and finally deciding on a plan, the benchwork was barely completed, and I decided to punch through a wall to get more space. I think we all have this affliction, of constantly trying to figure out how we can get just that little extra space. Your's is a major undertaking, I'm sure you'll be happy in the long run that you made the expansion decision early enough in the process. The room is pretty neat in these pictures, some more sawdust after cutting some more wood, but thanks to the vac not too bad. 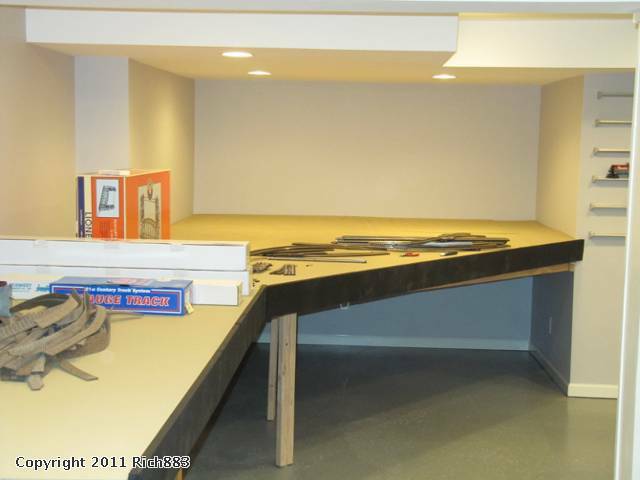 the layout started in the middle of the room before I finished the room, so originally there were no walls. Pretty lucky, not too hard to get the space, she has space upstairs. The portion at the far left has some book shelves, couch and chair for lounging, and in the far corner I will add a wine cooler and some wine racks. In the scheme of things, I'm a sixteen-year-old warehouse sweeper who's saving up for a downpayment on a used Honda Civic, but I'm ogling your Lamborghini. Your space and your layout are what dreams are made of. Thanks for sharing! 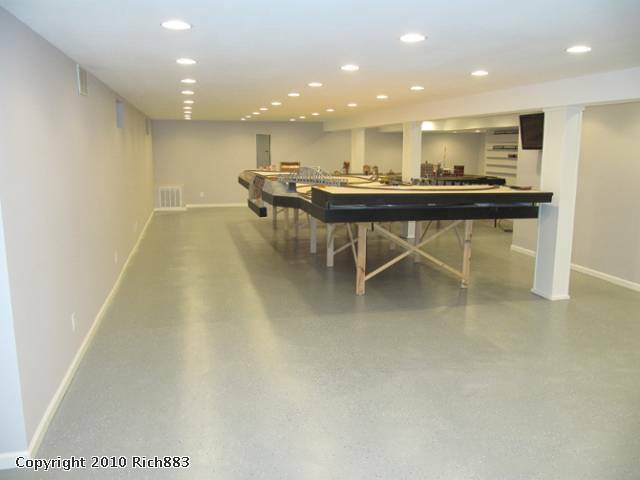 Room and layout look great. Love the trestle bridge. 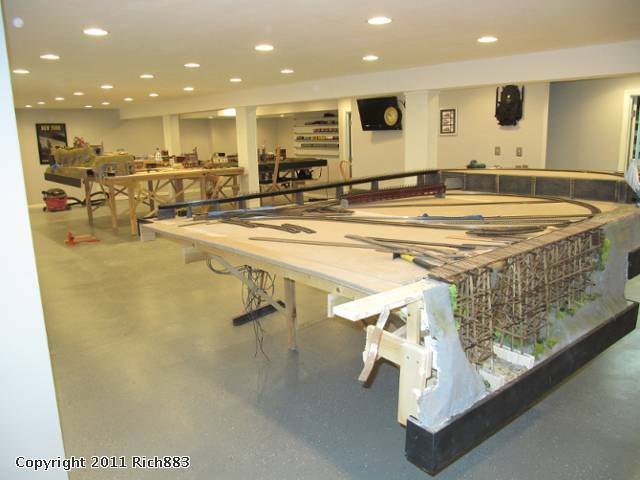 I have been completing more of the construction, here are some additional photos. At this point I have completed the framing, legs, girders, cross braces in the bench work, and covered it with OSB sheeting. Next step is to add the homasote. I intend also to add some additional elevation using dimensional lumber, and foam. I also found a Lionel lift bridge I intend to use in the harbor area. The gap you can see in the second to last photo is the access to the breaker panel that is behind the framed poster. This will have some lift out bridges to provide better access with less reach. Now that's what I'm talking about! I just hope there is more than 2 legs holding up that single family dwelling in the second photo. Yes, only two you see, the other end is attached to the wall. Oh my there's a layout monster on the loose!!! You are really making great progress and definetly will end up with a great final product. 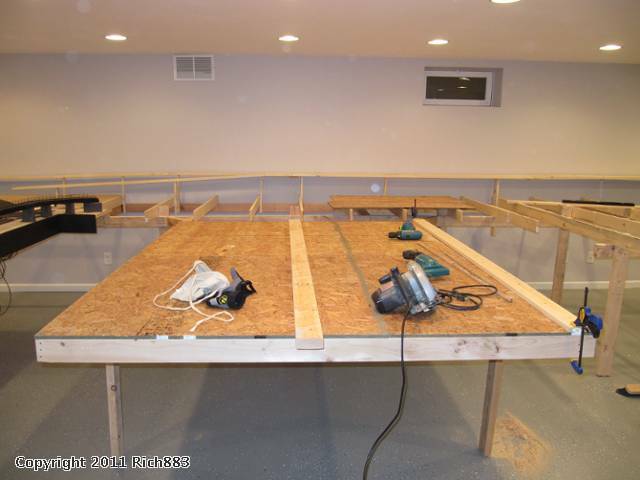 Well back at it again, I have made some more progress completing the bench work construction. The entire layout is now covered with Homasote. I have placed this down as the base on top of the OSB. 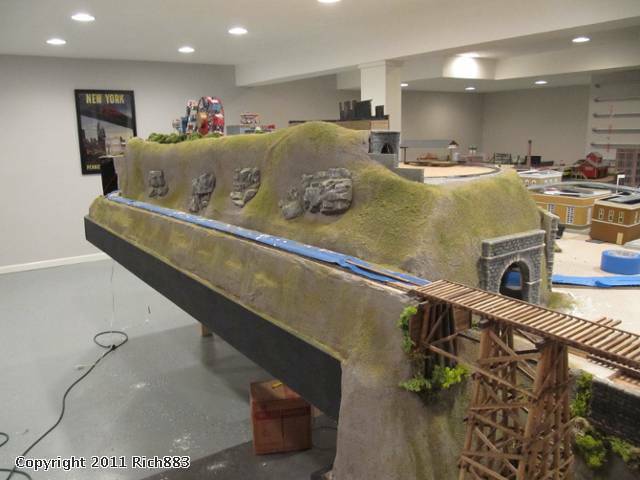 It is also on the elevated sections at the back of the layout. 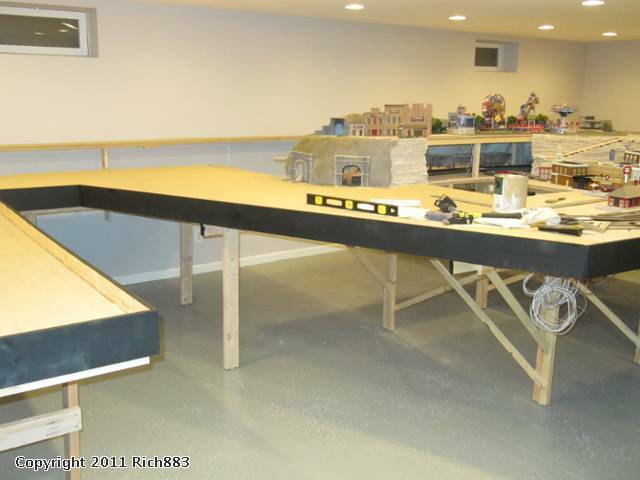 The grade to and from these elevated areas will be a combination of a trestle extension (I will extend the trestle at the back left of the layout to make a curve to meet he back elevated area) the inside track will ramp up using foam. The same type of approach will be on the back right corner where it comes back down. The homosote is painted with a flat latex paint, a kind of “sandy – mud - dirt color” I didn’t do this before, and when I saw the results others had here on the forum I tried it out. 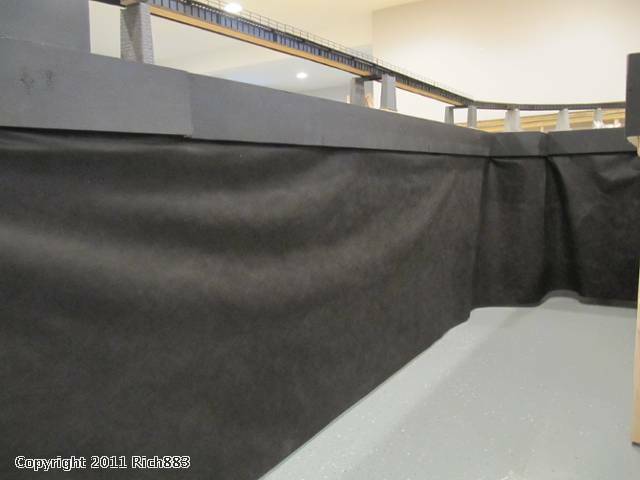 After the homasote was installed and painted, I added wood trim boards around the layouts – 1x6 dimensional lumber and then painted flat black to match the existing construction. Harbor area in the foreground right, look back across the city to the left. The harbor will have 2” foam to elevate the pier, I plan to install that next. I have removed some of the supports from the elevated line on the city peninsula, I am reworking that to have a line run beneath it, and then two sidings for passenger cars for a large passenger terminal. Harbor in the front left, looking at the smaller town and the “mountain” top “ amusement park on the right. Yards to the right, the gap you see is so I can get to the breaker panel behind the framed poster. 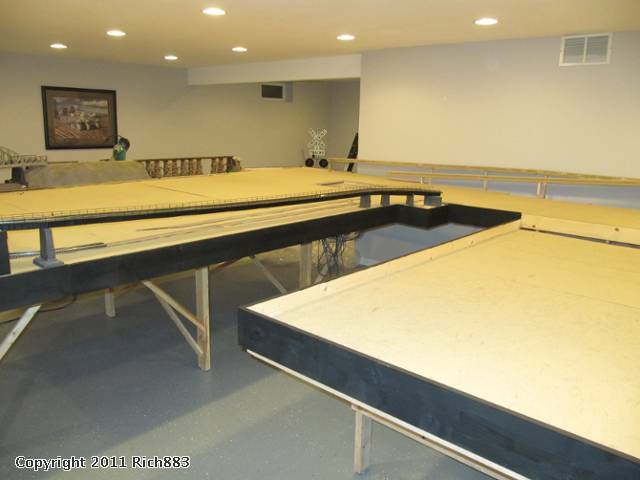 This will have a few removable bridges for easy access. I stocked up on some conduit claps to star installing for wire management, and while at it I will re layout my central wiring area to get better access to the AIU terminal strips. Things always seem to take longer than I expect, but I think the progress is OK. 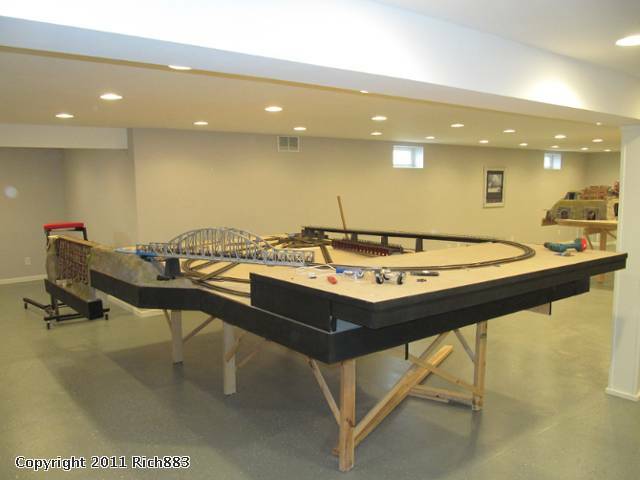 I am looking forward to putting the saws away and working on track and wiring next. As always comments and suggestions welcome. Things always seem to take longer than I expect, but I think the progress is OK. 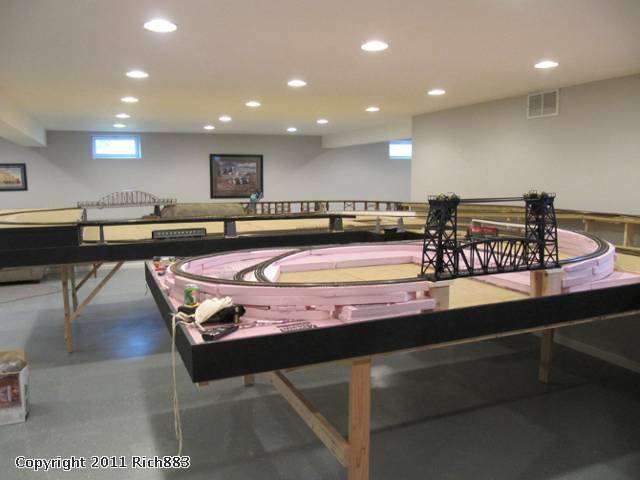 I am looking forward to putting the saws away and working on track and wiring next. I think your progress is excellent. I've had a touch of builders block lately, I am following a track plan, but lines on a paper don't always translate to what I am after in the building phase. I have wired on side to test switches and see trains run through the sidings, since I am still cutting roadbed it breaks up the monotony of the same old thing. Nice work, I've enjoyed watching your progress. Same thing going on in Holland Pa (philly area). Builders block---I like that term. I'm having a tough time with my track plan???? The minds eye sees one thing, the computer and real world see another. Thx for posting progress. It's a pleasure to "watch". Sometimes I just find that once you begin 'doing', things evolve and those things you were stumped on begin to work out. I have a hard time working within a set of rigid or confined parameters. 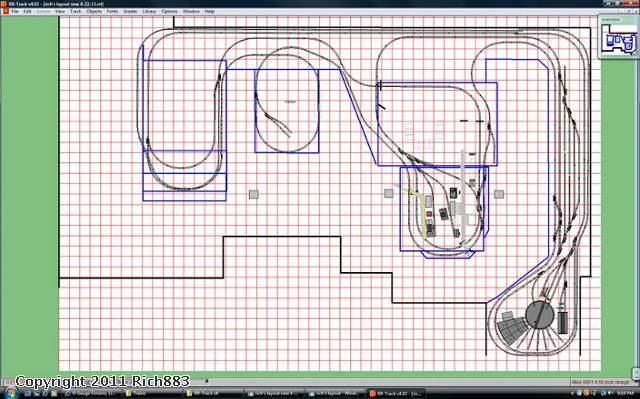 My track plan is merely a 24x36 scaled drawing of the room and benchwork with nothing more the pencil lines depicting what I think I want/like. After fretting over a track plan for so long I resolved to get going on it rather than continue in the endless search of the perfect plan and so far I am happy with the progress. Good luck and please share some photos. I have had some travel for work recently, and been unable to get things done on the layout, but I had some time this week to complete a few things. 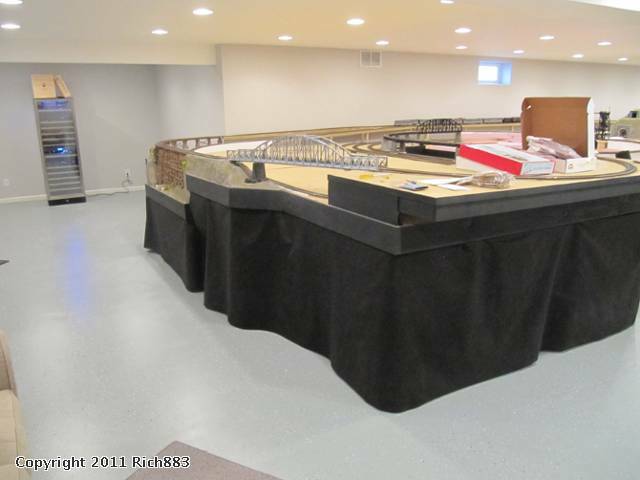 I have mostly been working on laying track, and installing the cork roadbed under it. 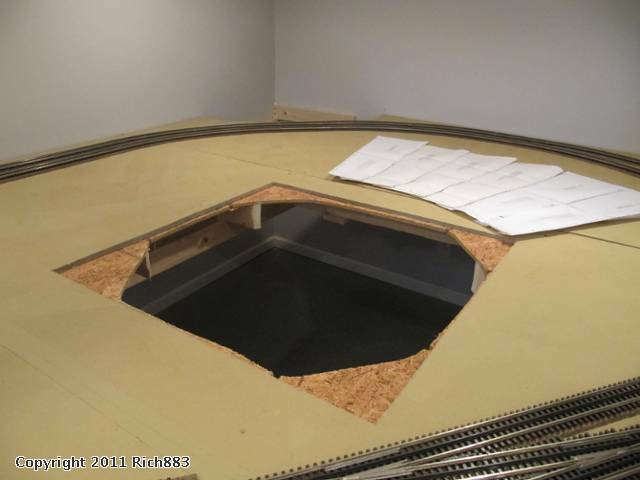 I generally layout the track first following my track plan, and slide the cork bed under the track. I secure the cork to the Homasote buy using some HO track spikes a simple nails. 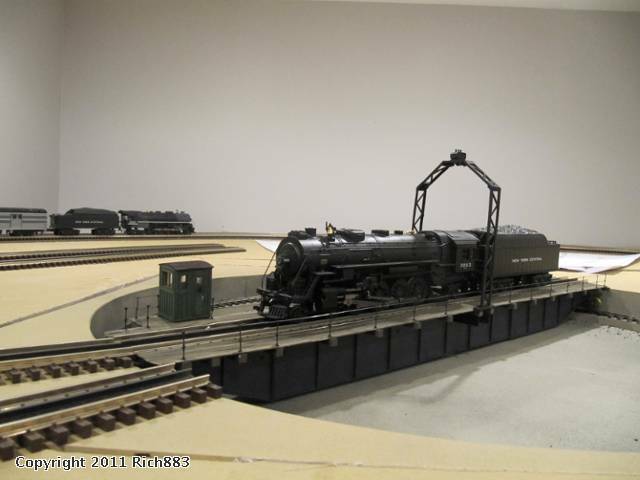 The first thing I did was to construct a curved trestle to join the side with the back of the layout elevated tracks. 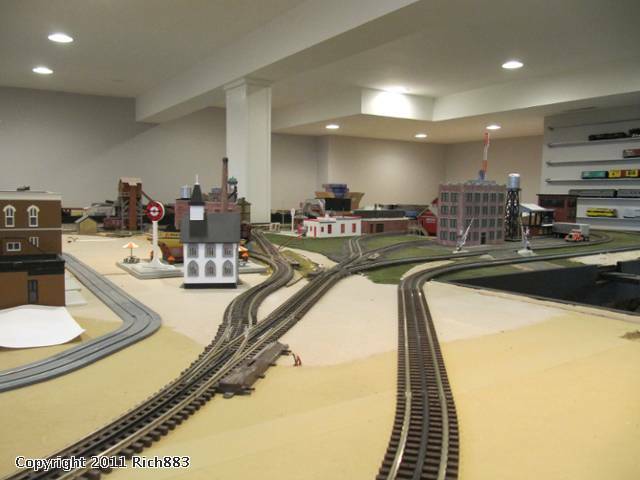 One of the new areas of the layout is to add a harbor area. This is on a peninsula that is about 8.5’ by 6.5’. I built the bench work lower to provide for the depth of the piers. 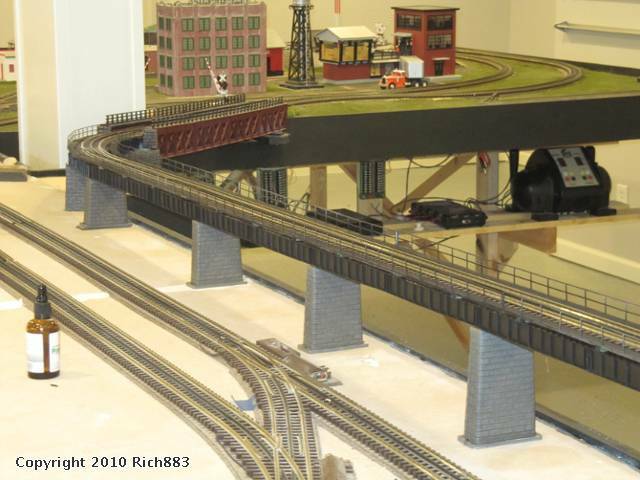 The loop around it has sidings to provide access to some planed oil storage tanks, and a freight house. I built up the piers using some 1.5” and 2” foam. The Lionel lift bridge serves as the entrance to the harbor, and is anchored to some risers of wood attached to the bench work. The back area will have another bridge for the overpass of the track coming from the elevated section on the previous peninsula. 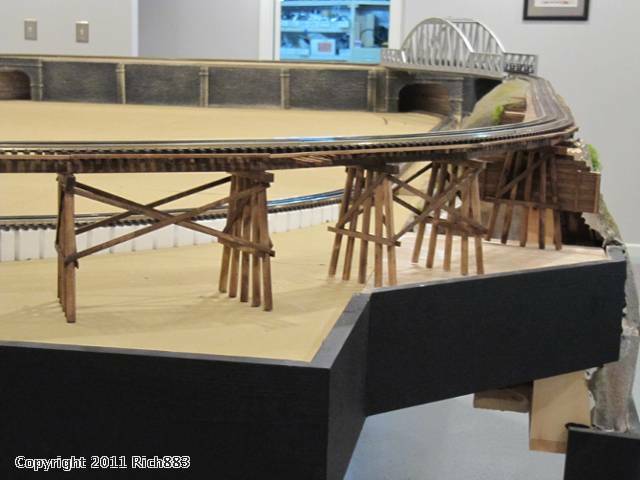 This has yet to be fabricated, so I used some MTH bridge supports for the time being. This view looks back at the small town/city that I had previous stated before I worked on this expansion. This is where the expansion ties into this existing peninsula. 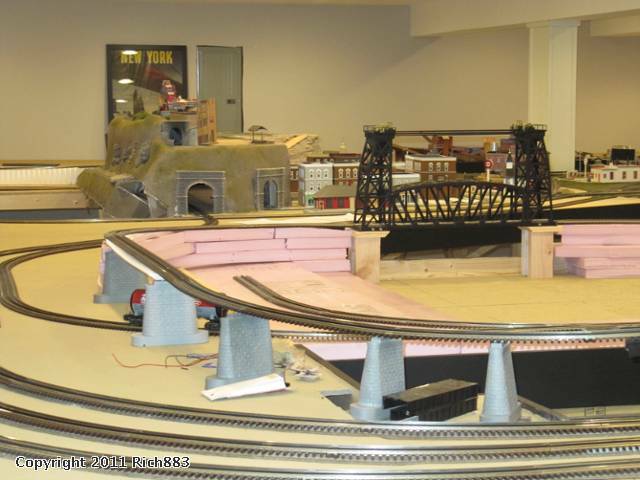 Here is a shot looking back across the layout in the direction of the first peninsula and the stairs. 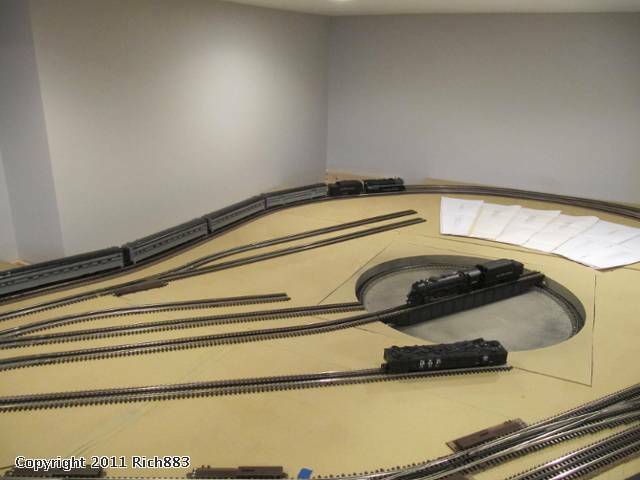 Next I will be laying the mainlines on the last portion, the new yard and service area on the far wall. Once done with that I will begin wiring. As always suggestions, comments and critique always welcome. 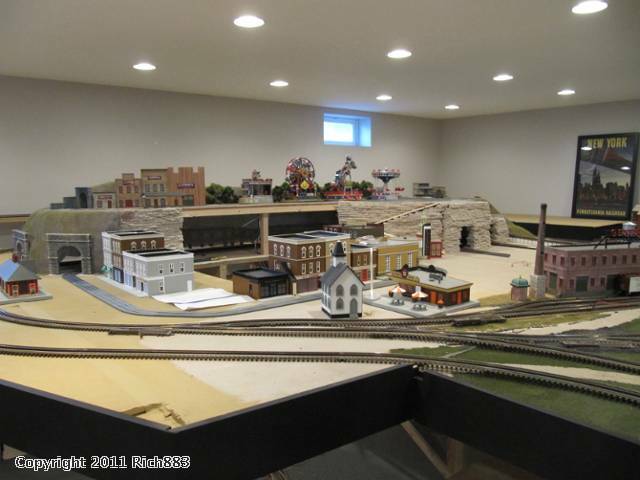 This layout includes lots of ideas I have gotten and skills learned here on the forum, so thanks to all who contribute. Rich, that looks awesome. Really like the section elevated on trestles--reminds me of Harper's Ferry. 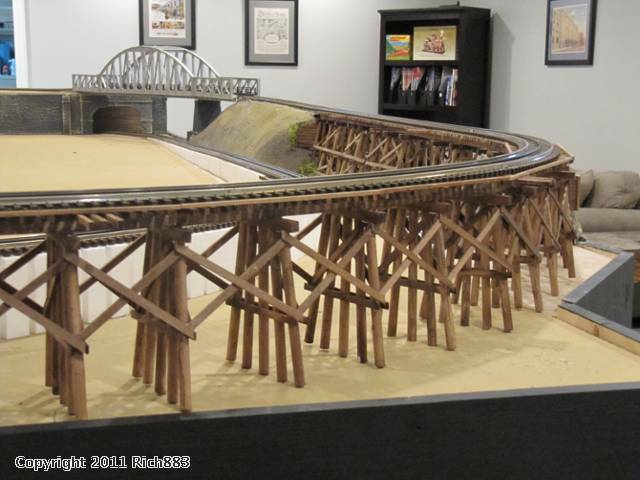 Where did you get that gray bowstring truss bridge I keep seeing in these photos? Awesome! Keep up the great work! Love the pics! I am really looking forward to that harbor scene. If your not sure on the wall in the harbor yet, I have tons of 3-4 inch screenrail pieces from work that is 3/4 wide that ive seen stood up next to each other to make the sea wall. This layout has really taken off since the last time I looked at your thread. 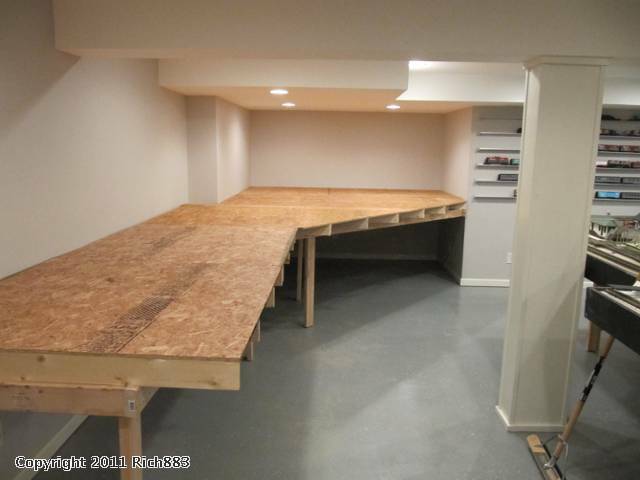 Awesome work man and I am ridiculously jealous of your basement! Looking at your second to last photo of the area in front of the breaker panel I had a thought. 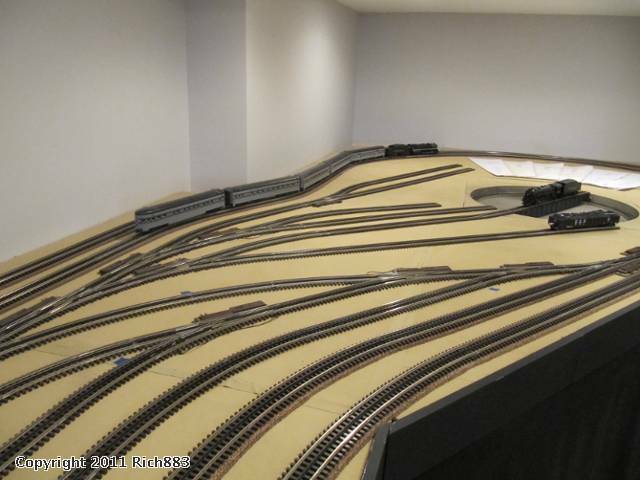 What if you put a hinge between the 5th and 6th track counting in from the edge of the layout and had the whole section drop down like an extension on a table? It might be easier than a liftout. Nice work and progress, and well organized wiring! It will surely make it easier for troubleshooting when (not if) the need arises. I really like your idea of the ground buss bars – that’s a real money saver! I have been using terminal strips (lots of them) that I had from my previous layouts, so I didn’t have to spend any money; but the use of buss bars sure is a winner. Rich....this is so impressive. I spent the last half hour looking at your photos. Please keep them coming. That Lionel lift bridge looks great. Access to the electric panel could be a problem in case of any sign off on a future permit, electrical inspection, electric problem requiring a visit from power company service tech or fire loss / insurance claim. Plus the unexpected open circuit breaker. Had to work around that issue on several jobs. Thaks for all the great feedback guys! After completing some more track power wiring, I moved to installing my bowser 32” turntable. I have had this in the closet for about 2 years now (I bought it form a forum member – very nice exchange). 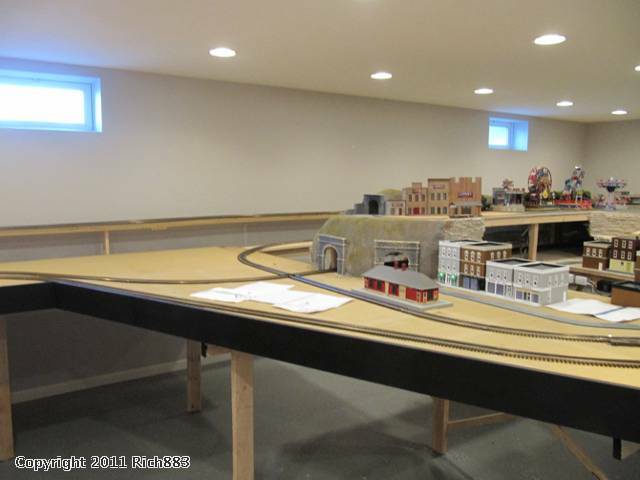 When I got it home I realized that I really didn’t have room on my existing layout, so in a way this was a driver for this expansion. 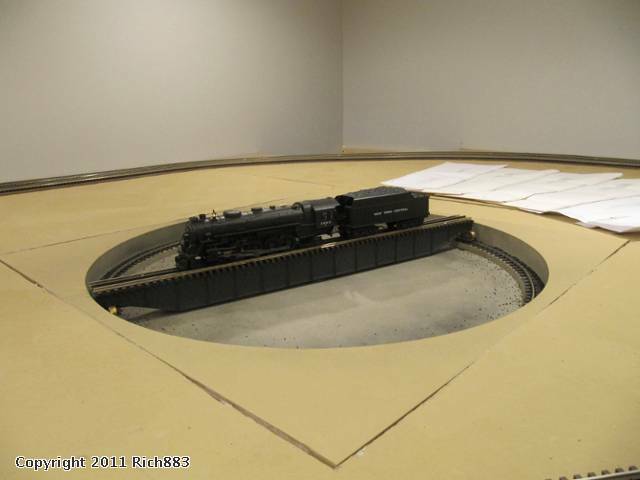 In order to complete laying track in the engine service area (just off the yard) I needed to place the turn table and roundhouse, I feel the rest will fall in around that. 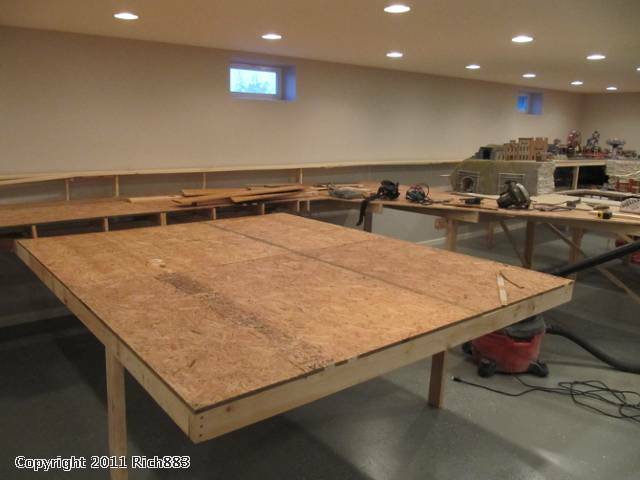 I measures and cut a hole in both the homasote level, and the OSB to support the turntable. 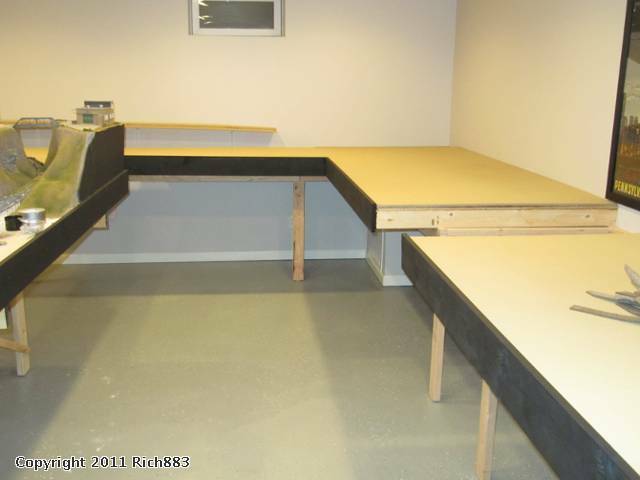 Additionally I reworked some of the stringers under the table for support. Once I had the table fitting in the cut out, it went back to my shop to do some quick weathering. I painted the top to match the “sand/mud” color I painted the homasote with, and stated a series of cement colors on the pit. I also added some grimy black, and added some black ballast/coal around the edges as if it fell in over time. I have the detailing kit, and have started assembly and painting the detail parts. I will add that once I get back to the turntable. I also decided, based on some of the feedback on the forum to purchase a mill house power upgrade, only wanted to do this once. Once that come in I will update the table and wire it in. The paper template is for a korber 6 stall roundhouse I have to build. 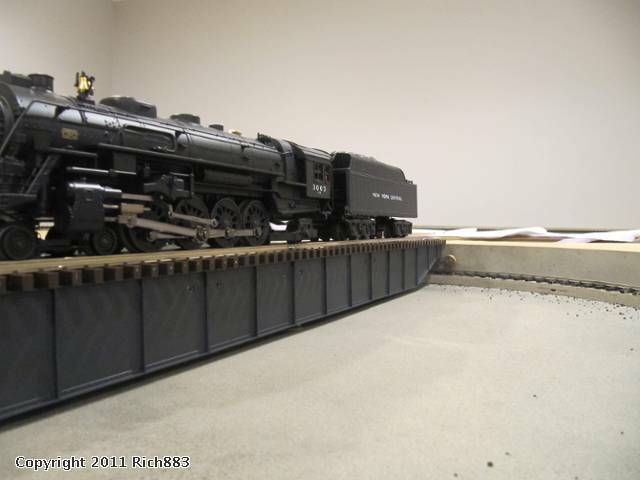 I had also been meaning to install a skirt on the layout, and was unsure of what to do. I had read some posts about using landscaping cloth, so I thought I would give it a try. I have a pretty large area to cover, so although something like table skirting looks great, it would be pretty costly for my room. I did one of the peninsulas in about 30-45 minutes, and I am happy with the results. As always comments and suggestions welcome. In the past few weeks I knocked off a few projects that don’t show much. I reworked some support brackets to make it simpler to install the backdrops I orders, and re placed some of the last wiring form the old layout that I still had in use. 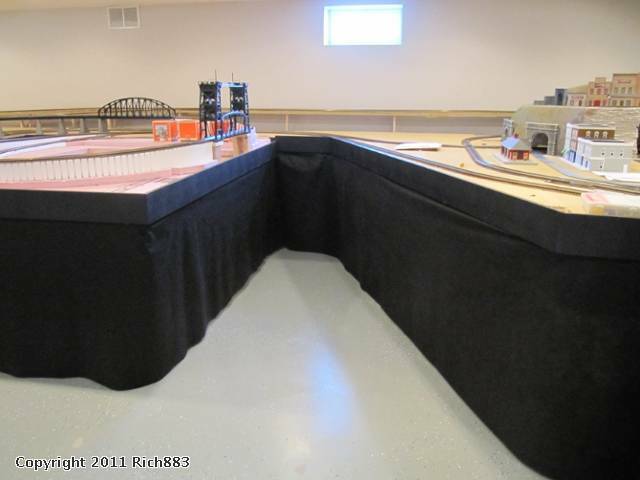 I completed the skirting around the layout. Given I had such a large area I needed something cost effective. I used the landscaping cloth, and I am happy with the results. I didn’t realize what a different it makes in the look of the layout. 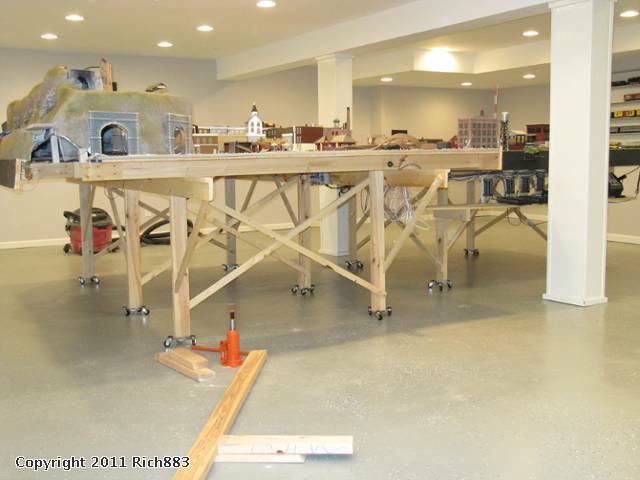 I continue to work on the turntable and engine service area. 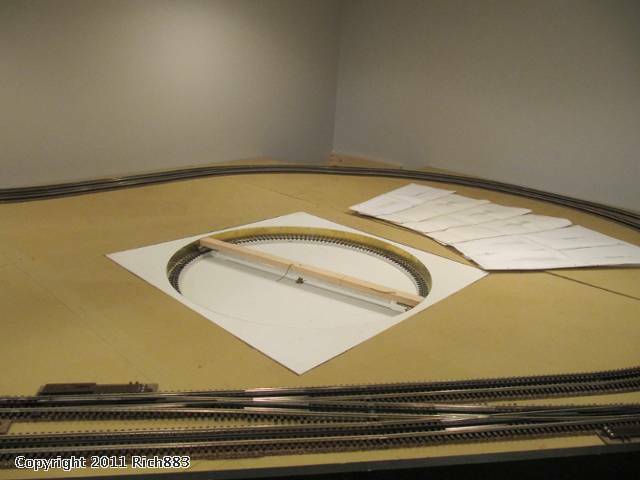 The first step for me was to install the turntable, and place the template of the roundhouse. 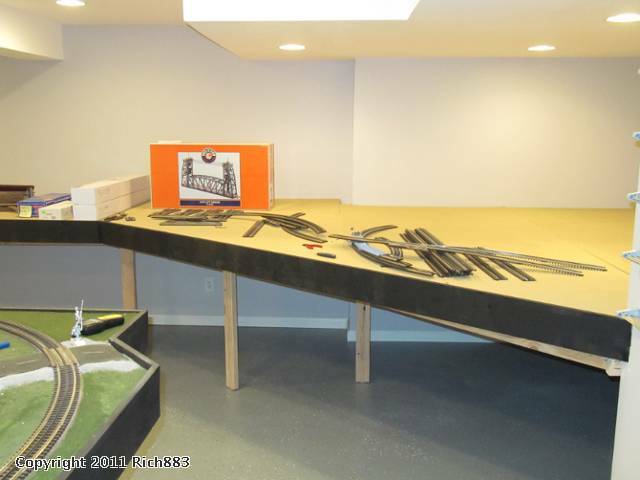 With that done I was able to lay the rest of the track for the area. It is accessed from the top of the yard, and has two leads to the turntable, a siding for coal to a tower I plan, and a siding for MOW cars. 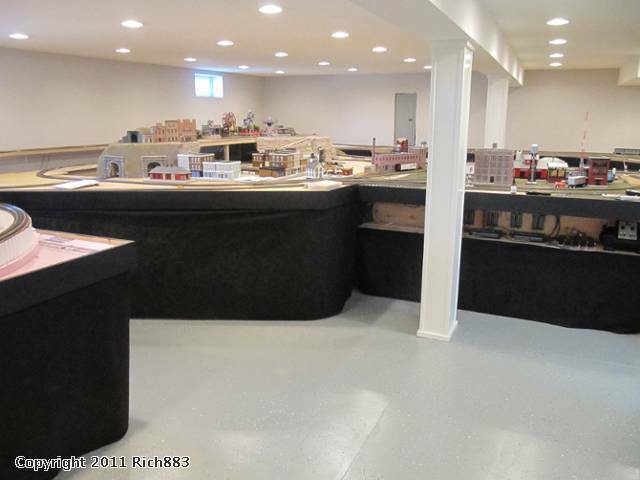 There is also an area for a two stall diesel engine house I will ad. 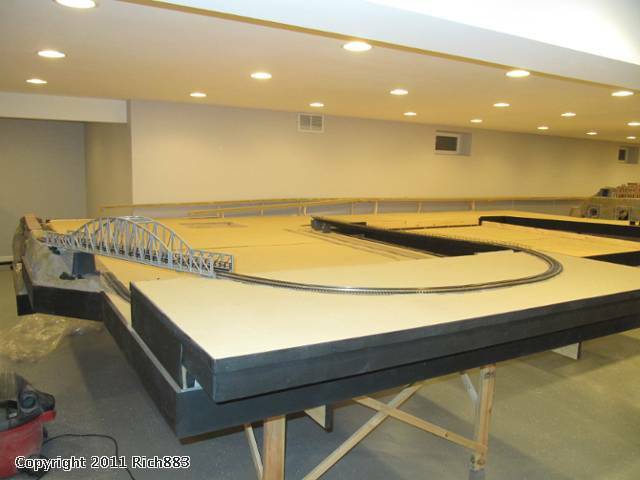 On the other side of the layout is a curved trestle area. I spent some time adding more bents, and some cross section supports to the curved part. 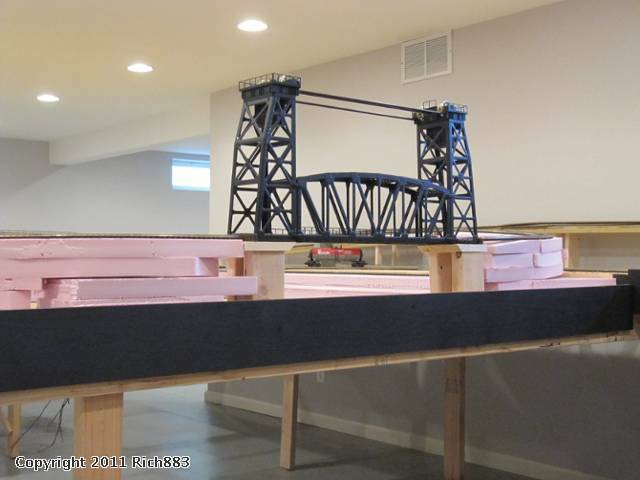 I placed it with only a few bents to get started, but wanted to make it more realistic with the right amount and spacing of trestle bent supports. 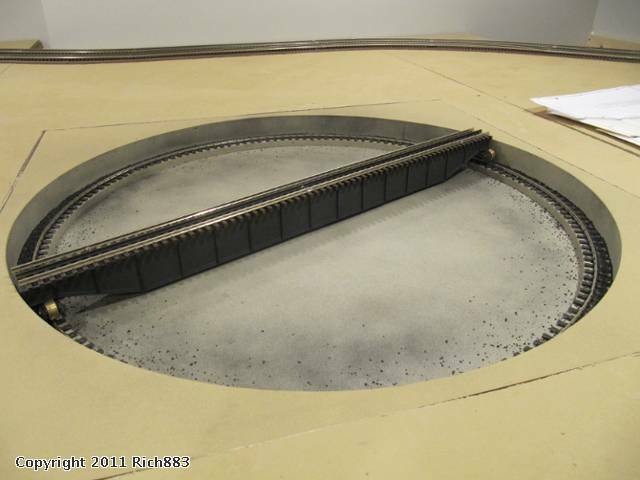 I have removed the turntable bridge, and am adding the detailing kit to it in the work shop. I hope to have that done in a few weeks. I have also started making the base for the roundhouse, and will start to build that. I am looking forward to making it to York this year. I have work travel, but will be able to get there for Friday and Saturday, especially meeting some at the ORG forum event at the grandstands. As always suggestions and comments welcome. Expansion looks awesome, thanks for the update. The black landscaping cloth does indeed make an effective skirt, may borrow your idea for my layout when I reach that point. Trestle looks great with the additional bent supports. Looking forward to seeing the update to the turntable. Rich, you've done a phenominal job in a short amount of time! Very impressive. I love your train room. It is so bright and clean. It must be great to have guests over. Just a couple of quick questions. Please don't mind my ignorance but could you tell me what OSB and ORG are? Phil osb is oriented strand board ... Compressed wood chips with resin to make a kind of plywood substitute ORG is spellcheck version of OGR, good catch. 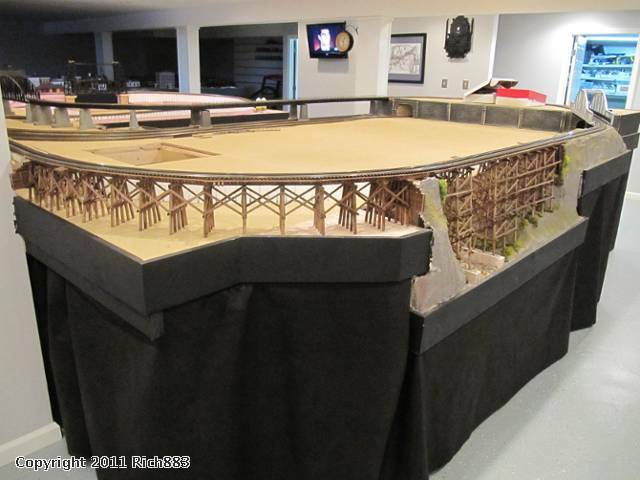 Here is some work I did to complete the detailing of the turntable bridge. I picked up both the control house, and the stanchions for the e railing form Al at Millhouse River while at York. He has these new laser cut pieces and new brass castings. Very nice pieces, I think they look much better than the stock parts in the Bowser detailing kit. Next stop is to build the round house. I have the outer walls together, and I am about ¾ of the way thru the wood supports. 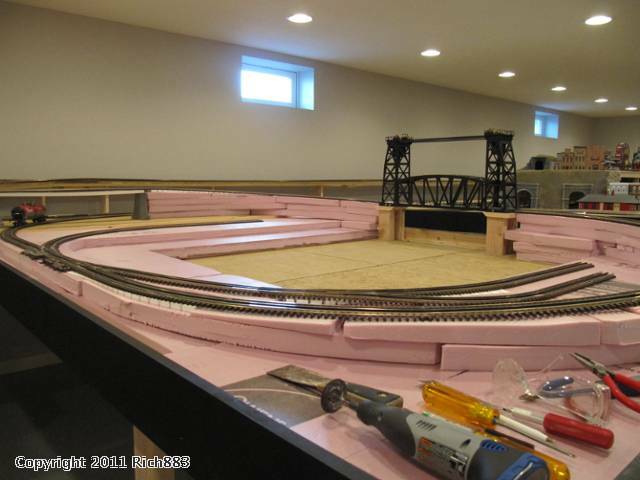 Very nice work, the turntable is progressing nicely. You really are creating a great layout, the pic's are making my mouth water so keep them coming. 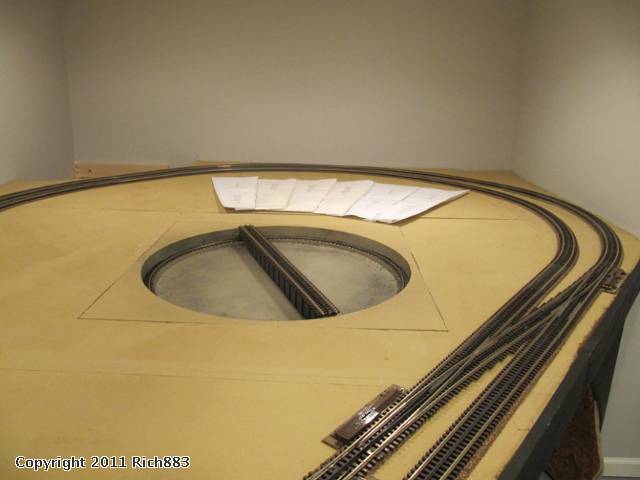 The turntable detailing looks great. The planking around the track rail looks darker in some shots and lighter in the others, guess it's the camera angle and lighting. The color of the base underneath looks very light, but I guess I'll have to wait to see it in context of the surrounding buildings and scenery.